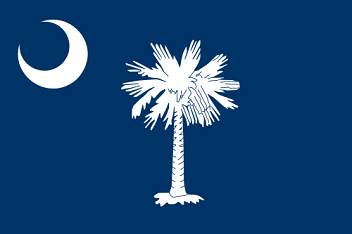 The unusual dark blue State Flag of South Carolina depicts a white crescent shape and the central image of a white palmetto tree. The significance and symbolism of these images are detailed below. The South Carolina flag serves as a symbol of honor, heritage and regional pride and is displayed at state buildings. There is a strict Order of Precedence for flags. State Flags are displayed in order as they entered the Union. Car Flags are often displayed to represent of an individual's allegiance to their state. South Carolina State car flags are used by their owners as mobile emblems of their home. Car flags are usually made from strong materials and are attached to a car via a pole and clip window attachment. What is the design of the South Carolina state flag? What does the crescent symbolize? Knights returning from the crusades introduced the crescent as an emblem. According to the ancient laws of heraldry the crescent is a symbol of the hope of greater glory and enlightenment. Crescents also represented the moon that lights the night sky for travellers. The crescent shape was worn on the front of the caps worn by Revolutionary War soldiers from South Carolina. What does the palmetto tree symbolize? The palmetto tree symbolizes victory in a battle against the British fought from a fort made of palmetto logs during the Revolutionary War of Independence (1775–1783) refer to the South Carolina State Seal for additional information. The color blue symbolizes vigilance, truth and loyalty, perseverance & justice. Blue also signifies the color of the uniforms worn by South Carolina troops during the Revolutionary War. Who designed the South Carolina State Flag? What is the history of the South Carolina State Flag? The South Carolina flag is kept and used as required by the code specified in the constitution of the state.